Aplastic anemia is a condition in which the bone marrow does not make enough blood cells. Bone marrow is the soft, tissue in the center of bones that is responsible for producing blood cells and platelets. Aplastic anemia results from damage to the blood stem cells. Stem cells are immature cells in the bone marrow that give rise to all blood cell types (red blood cells, white blood cells, and platelets). Injury to the stem cells leads to a decrease in the number of these blood cell types. Sometimes, the cause is unknown. In this case, the disorder is called idiopathic aplastic anemia. Symptoms are due to the underproduction of red cells, white cells, and platelets. Symptoms may be severe from the start or gradually worsen over time as the disease progresses. Low white cell count (leukopenia) causes an increased risk for infection. 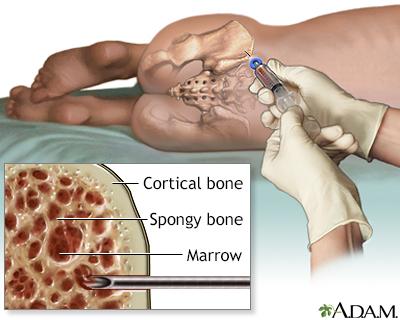 A bone marrow biopsy shows fewer-than-normal blood cells and an increased amount of fat. Mild cases of aplastic anemia that do not have symptoms may not require treatment. As blood cell counts become lower and symptoms develop, blood and platelets are given through transfusions. Over time, transfusions may stop working, resulting in very low blood cell counts. This is a life-threatening condition. Bone marrow, or stem cell transplant may be recommended for people under age 40. This treatment works best when the donor is a fully-matched brother or sister. This is called a matched sibling donor. Older people and those who do not have a matched sibling donor are given medicine to suppress the immune system. These medicines may allow the bone marrow to once again make healthy blood cells. But the disease may return (relapse). A bone marrow transplant with an unrelated donor may be tried if these medicines do not help or if the disease comes back after getting better. Untreated, severe aplastic anemia leads to rapid death. Bone marrow transplant can be very successful in young people. Transplant is also used in older people or when the disease comes back after medicines have stopped working. Call your health care provider or go to the emergency room if bleeding occurs for no reason, or if bleeding is hard to stop. Call if you notice frequent infections or unusual fatigue. Bagby GC. Aplastic anemia and related bone marrow failure states. In: Goldman L, Schafer AI, eds. Goldman-Cecil Medicine. 25th ed. Philadelphia, PA: Elsevier Saunders; 2016:chap 165. Young NS, Maciejewski JP. Aplastic anemia. In: Hoffman R, Benz EJ, Silberstein LE, et al, eds. Hematology: Basic Principles and Practice. 7th ed. Philadelphia, PA: Elsevier; 2018:chap 30.